The first week of May is always a bit insane in my little town. For being so small, our town has a booming dance studio, and dance takes over this week as our kids, ages 3-18, get ready for the annual recital. I took my own daughter to dress rehearsal tonight. It’s hard to believe that it’s her tenth recital week. Here is one of my favorite parts…she takes lessons from the same teacher who taught me when I was growing up. She performs on the same stage I danced on for fourteen years. So now, I get to be one of those dance moms who saves new videos on how to put my daughter’s hair into a different kind of bun, carefully applies her stage make-up, and sits with a huge, adoring smile on her face as she watches her baby shine. As I sat there tonight, in this strange mix of nostalgia and motherly pride, my mind went to all of the great things I learned through my years taking dance lessons. 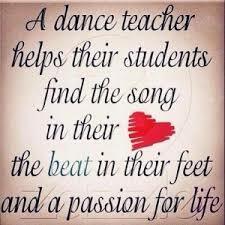 And it only seems fitting to honor my dance teacher, who happens to be my daughter’s dance teacher, during Teacher Appreciation Week. I was terribly shy when I was young. I’m not sure if that’s why my mother enrolled me in dance when I was three (guess I could ask her, but it’s late, and I’m tired, so I’ll just write random run-on parenthesised thoughts, instead). Our teacher, Miss Terri, was a teenager when she opened her studio in our town. Her mother taught in a neighboring town, so dancing and teaching were part of her genes (obviously she also has heaps of patience, determination, and love, as well). We danced in a few different locations before she purchased the studio where she still teaches today. I can’t explain the bit of excitement that I get each year when it’s time to enroll my daughter in another season of lessons in that same studio. I love that Sydney and I have dance in common. One day, I hope she’ll look back on these years and think about all she learned from her time with Miss Terri and on the stage. Today my stage is my living room and occasionally my kitchen. My audience consists of my husband and two kids. Dancing for them is all the dancing I need these days. But what I learned, and the characteristics I developed from my years in Miss Terri’s studio go with me in the way I interact with my family, the way I run my business and the way I live my life. Thank you, Terri, for continuing to give your heart to the kids of our community, and raising another generation of dancers.